Review: I read Speak, Laurie Halse Anderson’s first novel, soon after it came out in 1999* and it made a huge impact on me. It’s a book that I have read multiple times since. In that book, as in her subsequent work, Anderson shows a remarkable gift for writing about young people in difficult circumstances without giving in to melodrama, preachiness, or heavy-handedness. She also writes teenage characters who feel and sound like the teenagers I know. 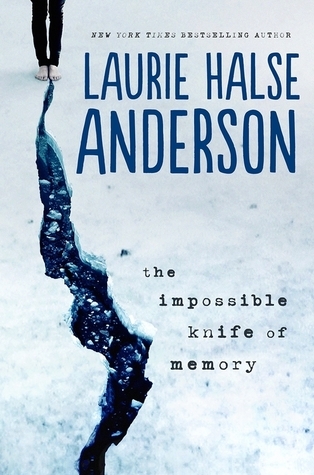 While I definitely still felt that these things were true in her newest book, The Impossible Knife of Memory didn’t totally live up to the level of Laurie Halse Anderson’s earlier works for me. The story follows Haley, a teenager who has come back to her hometown to finish her senior year of high school. For several years she’s been homeschooled, traveling across the country with her truck driver father. Her dad, Andy, is a veteran who served in Iraq and Afghanistan, and his struggle with PTSD (and related self-medication with drugs and alcohol) has grown progressively worse. Haley is his only support system, so it’s hard to get through a school day, not knowing what might be happening at home. In the meantime she starts to fall for a sweet boy named Finn, who has problems of his own. The relationship between Haley and her father, and the impact his PTSD has on Haley, himself, and their relationship is the strongest piece of this book. That narrative really works and always feels emotionally true and powerfully written. However, I think that the other dramatic pieces of the story start to feel – well – just like a lot. None of it read as melodramatic or inauthentic to me – Halse Anderson is too good a writer for that – but as a reader, I got to an overwhelmed point. We’re already starting with Andy’s PTSD and Haley’s struggle to take care of her father and deal with her own emotional experience of it all. So then when we add Finn’s sibling drama and subsequent parental neglect, Gracie’s divorcing parents, Trish’s alcoholism and recovery – it starts to feel like too much, and hard to parse through all the sadness to get to the story. With all of that, the ultimate resolution then felt like it came really quickly. However, I still would strongly recommend this book – and not just for those who the topical relationship is relevant. The characters and the well-written take on a difficult topic are totally worth the read. *BTW – I had to google to see when that book came out, and I can’t BELIEVE it’s been 15 years. It still feels totally contemporary to me. Also Kristin Stewart starred in the Lifetime movie they made of this book and she was great in it. It’s the reason I will still defend her as an actor to this day. This entry was posted in Reviews, Young Adult and tagged Father-Daugther Relationships, Laurie Halse Anderson, PTSD, Trauma. Bookmark the permalink. I read Speak also but I didn’t like it as much as I would have liked. Anyway I think I’ll give this one a shot because it sounds great and it’s always a plus if the characters are well written. Sorry it didn’t live up to your expectations but great review!